Art Activist Mavis Muller painted the banner "Alaska Still Fighting for the Earth" 29 years ago. The scoping process for the Pebble Mine is underway, and on Wednesday night the Army Corp of Engineers held a scoping meeting at Homer High School. Over 200 people showed up to make comments to the Corps, and many participated in a rally against the mine. Despite the Pebble’s recent permit application, several community members seemed confident a grassroots movement could prevent the project from moving forward. A large banner laid on the steps leading to the school’s front doors with the phrase “Alaska Still Fighting for the Earth” around a painting of Earth. Mavis Muller painted the banner 29 years ago after the Exxon-Valdez oil spill. She is a self-proclaimed “artivist”—her term for an art activist. She said the words are relevant again. Inside the school’s gym, Army Corps staff said there were no opportunities for people to give public testimony in front of a crowd. They directed people to write comments on about a dozen computers or share their thoughts with a transcriber as a short movie about the project made by Pebble Limited Partnership plays nearby. It’s hard to surmise whether a majority of the comments were made for or against the mine, but the contingency against the project was not hard to miss. However, it wasn’t just environmentalists or fishermen who were concerned. “I took one look at where the exact location of the mine is, my heart sank because there's so much at risk,” said Sarah Vance. Vance intends to run against Homer Representative Paul Seaton in the Republican primaries this fall. “We're the ones that the mining is going to impact even when they pick up and leave – that there's going to be lasting impact here, and we're the ones who have to deal with it,” she said. Even a miner named Peter Nagle showed up to speak against Pebble. “Pebble Mine is not only going to be a detriment to our creation here in Alaska, it's also going to in the long run hurt jobs. It's swapping one industry for another industry,” Nagel argued. Commercial fisherman Steve Schoonmaker said he’s not surprised by the pushback. In the past, Schoonmaker fished in Kamishak Bay on the southwestern side of Cook Inlet, where Pebble wants to build a port to ship out materials from the mine. A few other spoke about the port, but most peoples’ objections seemed to be focused more broadly on commercial fishing in Bristol Bay, salmon habitat or just the overall environmental impact of the mine. The Army Corps of Engineers will be taking comments until June 29, and it plans to hold six more scoping sessions ending in Anchorage on April 19. Correction: An earlier version of this story put the incorrect date of the meeting. It was on Wednesday. Over 100 people attended a community forum on the Pebble Mine hosted by Cook Inletkeeper Friday. The Pebble project was at an impasse for years but has recently moved forward under the Trump administration. In December, the Pebble Mine submitted a permit and the scoping process began on April 1. 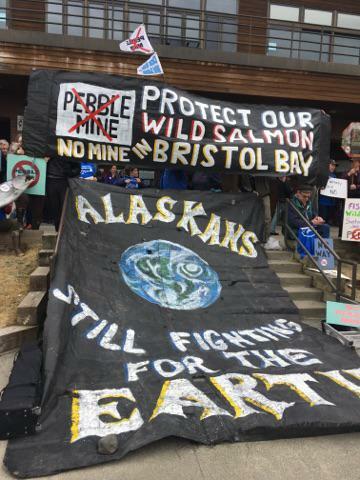 The Islands and Ocean Visitor Center filled to capacity as residents geared up to challenge the Pebble Mine.